Creative gift wrapping is my favorite thing this time of year. I have an outpouring of boxes (thanks to online shopping)...but they don't always fit the gifts I'm giving. 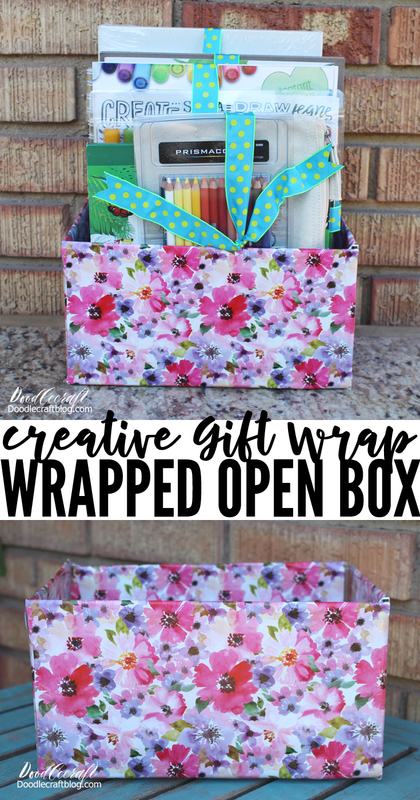 This is a great way to wrap something that you want visible, is too big for the box you own, or just to show off your amazing gift giving. Works great for bringing dinner over to a family too...just wrap the open box so it looks much prettier than just a box, but they don't have to return it. Repeat cutting the corners on all four corners. Fold down the top edge about an inch or so. Apply the adhesive tape on the wrapping paper on all the edges and across the top. Wrap it up over the box and tuck the flap inside the box. Repeat this process for all 4 sides. Now the box is covered all over the outside of the box and can be filled with all sorts of goodies. Stacked the tall way inside the open box for the cutest gift imaginable! I love receiving craft supplies, so this is my kind of gift! If you did a better job wrapping this than me...wrapping is NOT my strong suit...then you could use these for storage in your office or craft room! Great way to upcycle some old boxes!